The Peter Sefton Tool Shop offers a wide range of tools and consumables that have been hand-selected by master craftsman and furniture maker, Peter Sefton, for their quality and durability. The tool shop is an off-shoot from the Peter Sefton Furniture School, where Peter teaches a variety of long and short furniture making and woodworking courses. He has first-hand experience of all of the tools available to purchase through the Tool Shop and offers a comprehensive advice service if required. 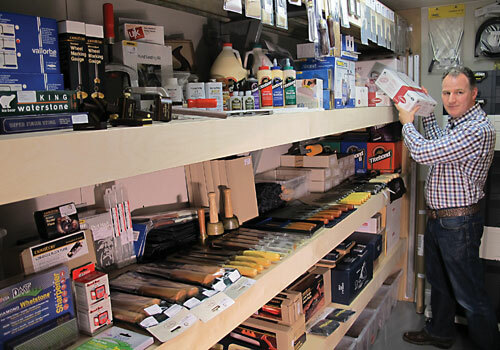 Peter has been advising enthusiastic woodworkers about buying tools for more than 20 years â€“ his students often ask him for advice and he has written numerous tool reviews for industry publications â€“ so setting up the Tool Shop was a natural progression for him. Quality tools are absolutely vital when hand-crafting furniture to the highest standard â€“ Peter devotes time during his courses to teaching the importance of tool selection and proper use. The Furniture School even offers a two-day course dedicated to hand tool sharpening and tool care and students at the Furniture School also get a 10% discount at Peter Sefton Tool Shop. Peter's enthusiasm for furniture making and quality tools is apparent in the tools he has chosen to supply, including some of his personal favourites from Clifton, Veritas, Thomas Flinn, Ashley and Ray Iles. The shop also sells an exclusive range from Joseph Marples and pear-handled Pax saws. Peter has a number of exciting ideas in the pipeline, including his own bespoke range. The family-run shop offers secure online purchasing via its website, next day delivery and a chance to 'try before you buy' on tools, abrasives and glues at its Worcestershire base, which is easily accessible from the M5 and M50.